The brain is the most vital organ in the human body and its health is of prime importance. As people age they tend to become forgetful. Or they may experience some other problems related to cognitive function and behavior. 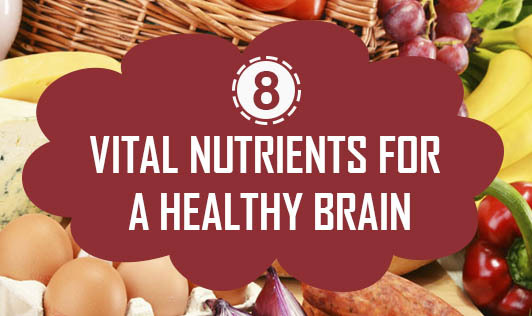 However, it is possible to keep the brain healthy by consuming certain foods/nutrients. Anthocyanins present in blueberries help boost memory. They also contain anti-inflammatory and antioxidant properties. Phenols (including phenolic acids, tannins, and flavonoids) found in the skin of walnuts are known for reducing the risk of Alzheimer’s disease. Omega-3 fatty acids sourced from flaxseed oil, salmon, and chia seeds are not only good for a healthy heart, but also enhance cognitive health. Research has indicated that these acids increase the ability to recall and remember things. Cocoa flavanols present in cocoa beans, apples, grapes, berries and tea leaves are good for blood circulation, heart, and age-related memory. They also improve the functioning of dentate gyrus, the part of the brain related to memory. Phosphatidylserine and phosphatidic acid are beneficial for cognitive function in elderly people, mood, and memory. The former can be obtained from cabbage, soybeans, tuna and boneless chicken while the latter can be found in Brassicaceae vegetables, starchy root vegetables, and Japanese radish leaves. Magnesium can be sourced from bananas, avocado, soy beans, and dark chocolate. People suffering from severe concussions should consume magnesium in the form of dietary sources or supplements. Choline aids in the communication in the brain cells and also in the cells of the body. It prevents cognitive failure as people age. The richest sources of choline are liver, beans, cruciferous vegtables, eggs and meat. Citicoline is a substance of the body’s cells, which aids in developing the brain tissue. It safeguards the brain from free radical damage and also maintains cognitive function. Some of the prominent sources of citicoline are beef liver, eggs, ground beef, tofu, navy beans, cauliflower, almonds and peanut butter.